Information: Harold Harton, square and round dance caller. Harold Harton was the founder of the Toronto & District Square and Round Dance Association (T&D) in 1951-1952. At that time, he was the Director of Social Recreation, for the Community Programmes Branch of the Ontario Department of Education. This branch was a new service which was to assist communities in Ontario in setting up recreational departments in a wide variety of activities. Harold's musical background was an asset in his work as a recreational director with the YMCA. During 1949 and 1950, there was an up-surge of interest in traditional Square Dancing. Several leaders of community groups in the Toronto and surrounding areas were approached by Harold. They were able to agree on a six week programme of dances. The dances were taught in each area and then they came together for a festival. It was a huge success attended by a capacity crowd. The result brought forth the idea of getting together and have the leaders exchange programmes and information. Physical education teachers who had attended Bob Osgood's Asilamar in California and had learned dances from Texas and California, also had learned different teaching methods. Instead of teaching routines, Dr. Lloyd (Pappy) Shaw had broken the dances into basic moves which could be interchanged. The visiting couple dances became ones with all dancers being active at the same time. Square Dancing was changing with a great interest in the Toronto area. The forming of the Toronto & District Square Dance Association with Harold as founder, brought together school teachers, recreational directors, and traditional callers. The attendance grew to over 60 people in the first year. The format of exchanging calls, rounds and mixers with prepared notes to take home became the pattern of the meetings. 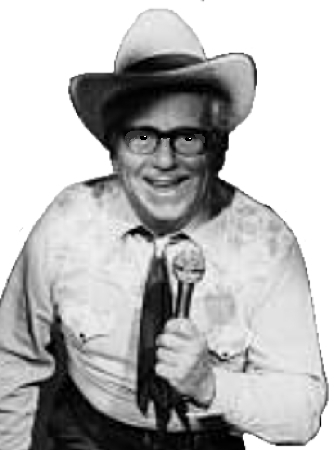 Rickey Holden was the first traveling caller to do a weekend course in September of 1952. During the fall of 1951, Harold had been asked to bring a group of Canadian dancers to dance in Chicago at a national convention. He trained and led two squares of local leaders and danced traditional calls, including Dosi Ballonet. Harold and his group met some of the leading callers from the United States, including Ed Gilmore, Dr. Pappy Shaw and his wife Dorothy, Al Brundage, Don Armstrong, and Rickey Holden. In the 1950s, Harold travelled in the summer and was on the staff at the Lloyd Shaw School and the Lighted Lantern Camp in Colorado. He was a part of the staff at many other leadership training and dance schools in the United States. In 1952, he organized and taught the program for the first Pairs 'n Squares dance camp. This became a popular one week annual summer camp which continued for almost 20 years. He hired the best available staff. There was always a waiting list to attend. The Central Ontario leaders were well represented to benefit from the leadership of Bob and Becky Osgood, Manning and Nita Smith, Frank and Caroline Hamilton, Al Brundage, and many more. This training did much to improve the callers skills and the dancing skills of their areas. While on staff at the Department of Education, Harold took Square and Round dancing to many cities and towns in Ontario. One fall he did a course in the Ottawa Valley for six weeks. He called in a different town each night of the week and travelled from Pembroke to Cornwall each week. He also went into centers in Northern Ontario where there were no connecting roads. He took his public address system and records and travelled in the caboose of a train. Equipment had tubes in those days and the records were l0-inch vinyl which made a heavy load. He called at a number of summer resorts in Muskoka every summer and for many years called at the Canadian National Exhibition (Ex). That required him to be at the Ex every day for the twenty day period. His out-door dances for the Toronto Parks Department were very popular. He called four or five nights a week with live music. For many years he had his own band. He used traditional dances, with a few modern moves for variety. His programmes were always social with lots of fun and laughter. He had a number of Senior groups and he was always their popular leader. At the 1986 T&D Convention in Hamilton, Harold was the first leader to receive the Trillium Award. This recognized his work as the founder of T&D as well as his outstanding leadership throughout the years. At the T&D 45th Anniversary in l995, he was still calling a regular schedule. In l996 he had a hip replacement and was forced to retire. At a celebration of his retirement, he said he called one dance  for the zoo  for the staff! His wife Gertrude predeceased him in December 1998. Harold celebrated his 90th birthday December 30, 1998. His death on January 27, 1999 saddened the square dance community. Tribute written by square dance caller Orphie Marcellus (former executive secretary for Mr. Harton).